The Charlotte County Boca Grande Street and Draining Advisory Board met on Monday, Aug. 20 to discuss a variety of items on the agenda. The first topic addressed: Exotic animal control. United States Department of Agriculture employee Samantha Rushing is an iguana technician who is contracted through the county to do animal and plant health inspection services. Rushing has been working to remove iguanas in Boca Grande since last November. Part of Rushing’s job is to come to the island and check the traps, and then investigate different areas on foot as well as respond to complaints of sightings. She does not search on properties without prior permission from the property owner. 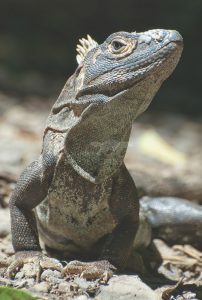 Board Chair Tim Freeman said the object is not to eradicate the iguanas, but to reduce the number of them on the island. Rushing uses a 22-caliber gun to shoot at the iguanas. She said since she is not allowed to shoot the creatures at the Boca Grande Club, if any are reported at the development, it is out of her hands. Freeman said he has heard about Gasparilla Island Bridge Authority employees shooting them around the bridge, but has not confirmed any numbers with the organization. Other items discussed were the current state of the beaches due to red tide, road paving and drainage issues in Boca Grande. The flooding at Gasparilla Road at the north end of the island near Grande Quay was brought up at the meeting. Freeman said that happens because the drainage ditches are at water level, the same as the lake located just west of the road. Road paving in Boca Grande (in Charlotte County) is not scheduled again until 2030. For more information, visit charlottecountyfl.gov. The Lee County portion of the island is still patrolled by Trapper George Cera.